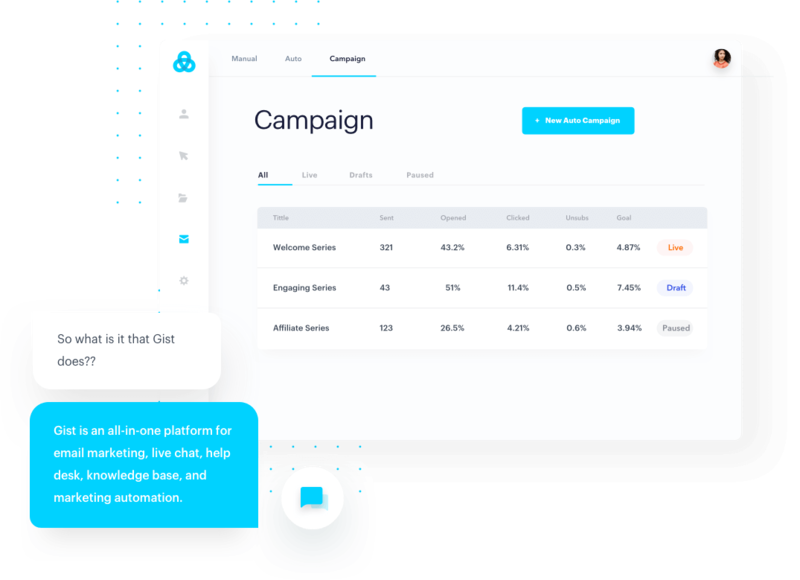 From email marketing, to live chat and chat bots, to knowledge bases - a suite of products for marketing, sales, and customer support teams to build better relationships and deliver great experiences. Use one, or use them all! Easy to configure chat bots that can schedule sales calls for you automatically. Live chat, ticketing and knowledge base software to support your customers. Increase sales by sending each lead a hand-crafted email campaign, at scale.Stop sending the same email to all of your subscribers. Trigger emails and drip campaigns automatically using any interaction your users have with your content and guide each prospect on a personalized path to purchase. Learn who your best customers, your hottest leads, and your biggest fans are by automatically tracking their every interaction with your website, emails, or in your app. Identify growth opportunities by understanding each customer's journey with instant, retroactive insights. Save time and scale growth by automating repetitive tasks. Automatically apply tags, create user segments, send targeted drip campaigns, and more based on rules that you decide. We're also excited to announce the arrival of visual workflows in Q1 2019 - a simple way to craft personalized journeys for every customer.